Held fast within the darkness, you stretch in the warmth and the hard shell around you cracks. Exposed, after countless moons, perhaps centuries, the varied terrain of the hatching grounds spreads for your eyes. Larger beings, elder dragons, pass past other nests, their Hearts pulsing with Ancient power and secrets untold. Your mission: to grow in strength and wisdom, master various tests and challenges that you encounter, and find your place. Encounter Gwydion and learn his magic, watch the Alchemist with his projects and experiments, battle legendary monsters. Chase after the treasures of dragon pirates, explore new lands, or haunt ancient shrines. 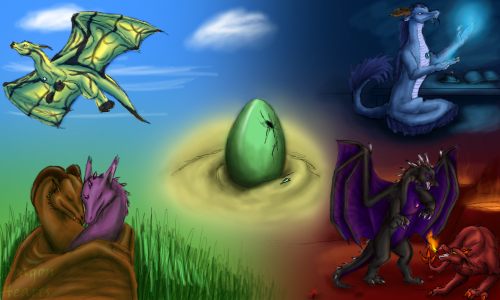 Chat with other dragons in the forests and ever changing scenery of the commons, and learn strange things... Forge mighty armour and weaponry, fit for epic battles. Do you have the will and the Heart to become the greatest? Will you find a conclave, or will you wander alone?